Everything you need to know about every camera worth using. If you've ever asked these questions, this is the app for you. Whether you’re making decisions on set, troubleshooting in an edit bay, or figuring out which camera to buy, we’ve got you covered. 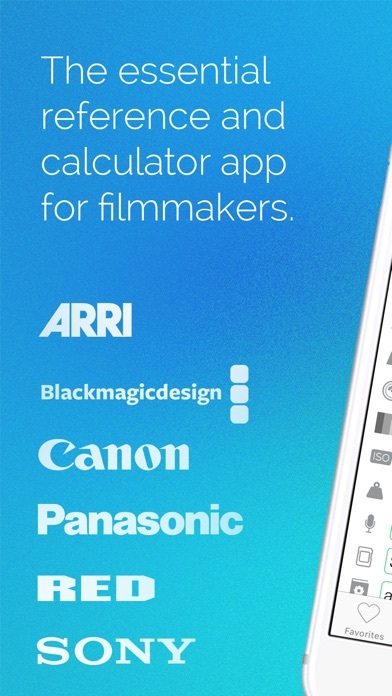 • Search over 100 cameras with a list that includes Arri, Canon, Red, Sony, Blackmagic, Panasonic and more. Or browse by format, from modern standards like ProRes and DNxHR to older ones like DVCPro-HD and Betacam. • Specs include dynamic range, sensor size, native ISO, lens mounts, resolutions, frame rates and more. 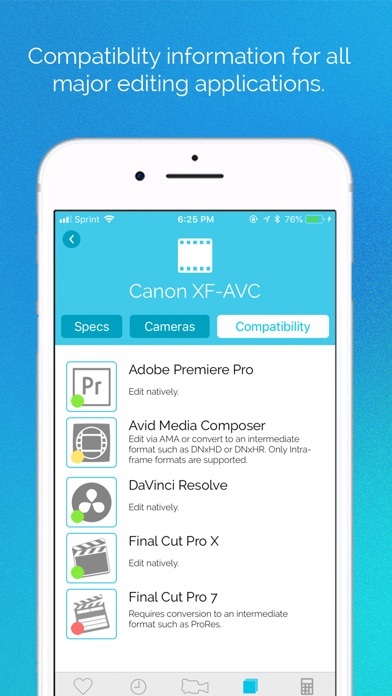 You’ll see how well each camera and format performs with the latest versions of Final Cut Pro, Premiere Pro, Avid Media Composer, and DaVinci Resolve. Plus there's a link to the manufacturer's website for firmware & manuals, and a phone number for support in your country. 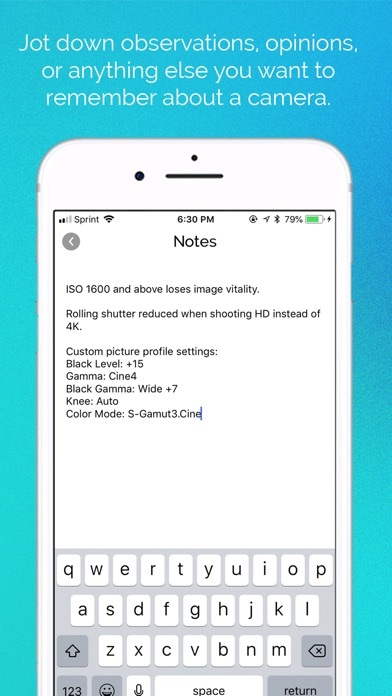 • Use the storage calculator to determine how much footage you can fit on your camera card or hard drive-- or how much storage space you'll need for a given recording time. The transfer time estimate shows how long it should take to copy that footage. 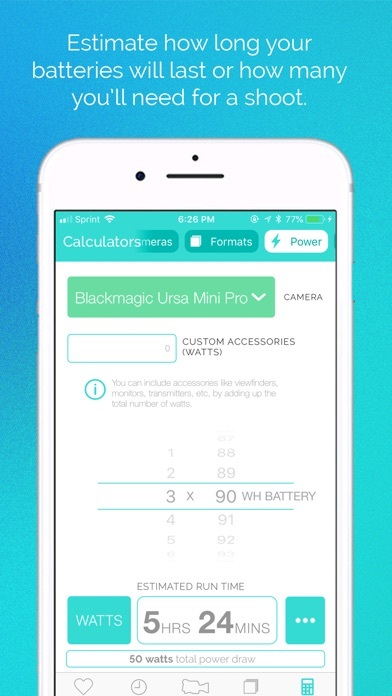 And the power calculator can tell you how long your batteries will last, with the option to factor in accessories like your monitor or wireless transmitter. "With the abundance of camera formats now out there, it’s easy to get lost with which system can do what. 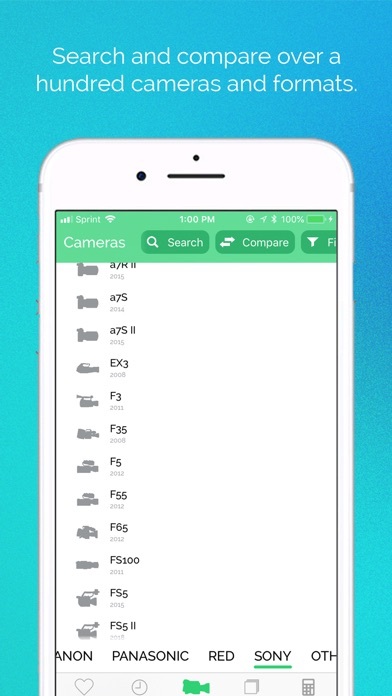 With the Cameras + Formats app this information is now at your fingertips." "This is one of my favorites. 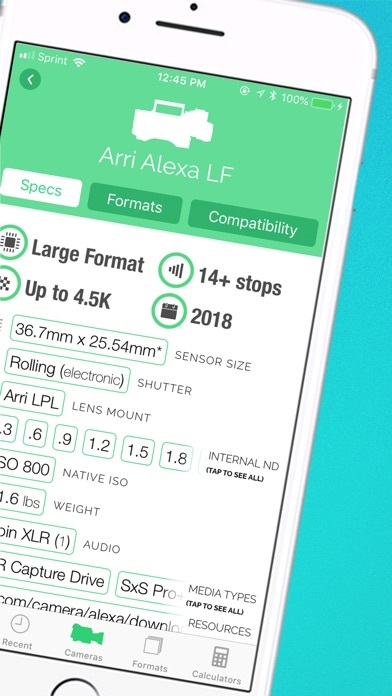 It has every single piece of information for nearly every single camera on the market today. Comparing recording formats between cameras has never been easier." 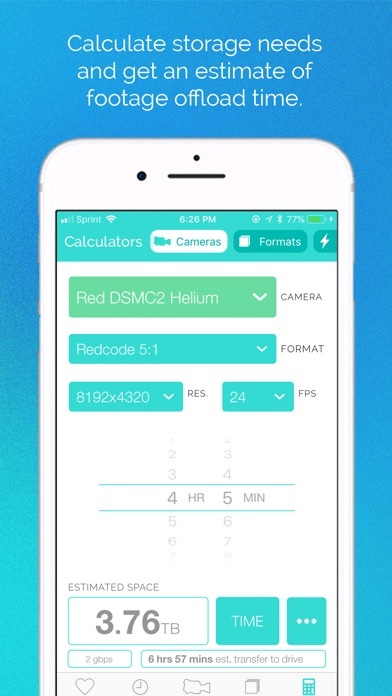 Visit http://grayhourmedia.com/formats-feedback to vote on the next cameras to be added, report bugs, or send feedback. Or follow us at twitter.com/CamerasFormats or facebook.com/CamerasFormats for news, announcements and support! Current countries for manufacturer phone support are the US, UK, Canada, France and Germany. The "price" feature uses affiliate links from B&H Photo Video. We receive a commission if you make a purchase from one of these links. Cameras + Formats is designed and maintained by Gray Hour Media in NYC. Gray Hour produces fresh and original content for film, episodic and the web. Head to www.grayhourmedia.com to check out our work! Coding is done by Ryan Powell in the UK. Thanks Ryan! 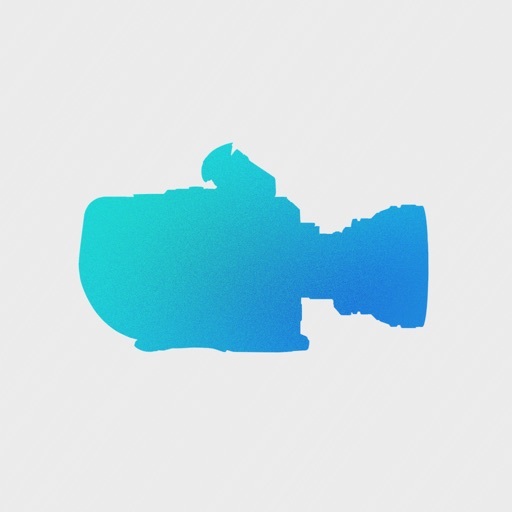 Search from over 40 cameras with a list that includes Arri, Canon, Red, Sony, Blackmagic, Panasonic, and GoPro. Or browse by format, from common standards like ProRes and DNxHD to older ones like MPEG-IMX and Betacam. Dig deep into each camera and format, with a wealth of information such as dynamic range, sensor size, native ISO, supported resolutions, frame rates, bit rates, chroma sampling, and more. You’ll also see how well it performs with the latest version of Final Cut Pro, Premiere Pro, and Avid Media Composer. 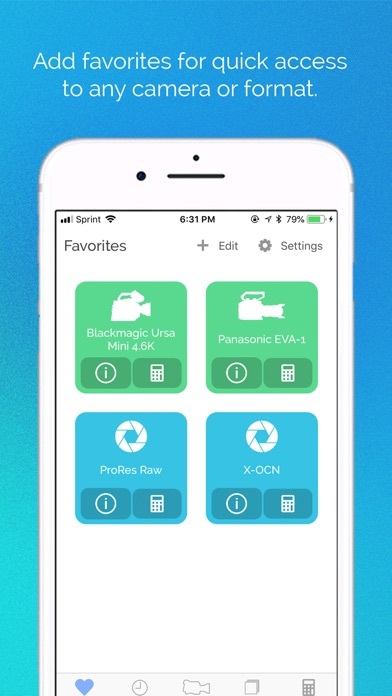 Then use the versatile calculator to find out how much footage you can fit on your camera card or hard drive– or how much storage space a given amount of footage will take up. You can also calculate audio, and share your calculations!